Before we head into the deeper workings of the game, let's take a look at how well it currently holds its place in some of our favourite websites. The original has been rated an 8.0 at Lemon64 with a total of 144 votes, placing it at #84 in the Top 100 list, based on at least 100 votes. World of Spectrum users with a power of 42 have given it a total score of 7.97, which is surprisingly good, but doesn't reach the Top 100. CPC Game Reviews has given it a remarkably low score with 3 out of 10, but we'll see later on how close to the truth it is. Out of all the 8-bit versions, the NES rating is again the most difficult to find, so I have no exact knowledge how people rate it, but from the comments I've read on the internet, it isn't very highly rated at all. Platoon is a multi-genre maze-centric shoot'em-up, set deep in the jungles of Vietnam, just as the movie is. A lot of people seem to have trouble noticing this, but the real emphasis here is definitely in the "maze" part of that equation, particularly the first section. So, at least people who have grown up on arcade-adventure games should be at home here - you only have to concentrate on keeping yourself alive as well. When you enter the combat zone, as the game prompts at the beginning, you're dropped in a non-descript passageway deep within a jungle, filled with VC coming to kill any Americans, particularly you. Your mission is to find explosives, plough your way across a bridge, which must explode, and proceed to a village and get into the underground tunnel system, while deflecting the VC attacks by blindly shooting at nothing, in hopes of your bullets actually hitting something. The passageways are laden with hidden VC soldiers, coming up every now and then shooting at your feet, and tripwires that will blow a nearby grenade, killing one of your five soldiers instantly - so you need to be jumping quite a lot as well as shooting; and if you're good and quick enough, you can blow some hidden soldiers up with grenades of your own. Also, pulling the joystick down makes you duck, but if you happen to be right at the mouth of a path up or down, you will go through the path if you control your soldier up or down. Once you get to the village at the end of the level, you need to be careful not to shoot any innocent villagers, or your morale will drop significantly. The game will be over either when you're out of soldiers or when your morale has dropped to zero. The key to beating the first level is clearly to either draw a map of the whole area and plan your route with that, or play the game so much you can remember the route by heart. Once you have gotten into the tunnel system, you have a map screen at the right side of the screen, and the first-person action screen at the left. Note that you can not enter the tunnel system without a map and a torch, both of which can be found in the village at the end of level 1. You have two modes of control in the tunnels: the first one is for moving in the tunnels, and the second one for aiming and shooting or examining various containers in chambers. The moving happens according to your perspective, so the arrow in the map points to the direction you are looking/moving at, and you move by going forwards, and changing your bearing by pulling the joystick left or right. Whenever an enemy enters the screen, or you enter a chamber, your control turns to the cursor mode. Your mission here is to find two sets of flares, a compass and some secret documents, before heading to an exit near the bottom right corner of the map. There is another exit in the tunnels, but it's the wrong one, so it will eat up some of your morale if you try to exit through that one. Once you're ascended through the correct exit, you are presented with a first-person view from inside a bunker, and it's night time. You have to survive the night by shooting at the VC for a period of time, which will be easier to see if you use the flares. The final section will look familiar to Contra fans. Again you are moving through some jungle passageways, but in a third-person view mode, where the camera is set at your end of the path, and you have to move away from it and turn either left or right at the end of each passage. This is where the compass comes into play - you have to follow where it is pointing and try to find the escape helicopter with that. Naturally, the passageways are filled with mines and running enemies, shooting frantically at you. Finally, you will be faced with the mentally unstable Sergeant Barnes, who you will have to eliminate. This section is, by far, the hardest part of the game, and considering that you can't even practice it, I recommend you to seek out a cracked game with a trainer and a level skipper feature so you can make a map for your proper gaming session at a later time. So, once you have reached the ending, you will notice that it wasn't about winning anything; war rarely is. You will be happy enough that you survived, and that's all there is to it. At least you will be able to tell your ignorant friends afterwards that "they don't know, they weren't in 'Nam." Seriously, though, as far as maze games go, this is one of the more unique takes on the idea, and it's also one of the rare good movie license games. Because Platoon was originally released as a multi-loader, meaning that the game has to be loaded in several parts, I have decided to only tell how long it takes to load the first part of the game, unless the whole game loads up in one load. The disk versions' loading times will be measured similarly. The versions I have as originals are the Amiga disk, the Spectrum HitSquad version and the C64 original box release, but I could not locate a tape image file of the original C64 tape, hence the "??:??" marking. I might fix this as a later date, once I have either located the said image or made one myself. 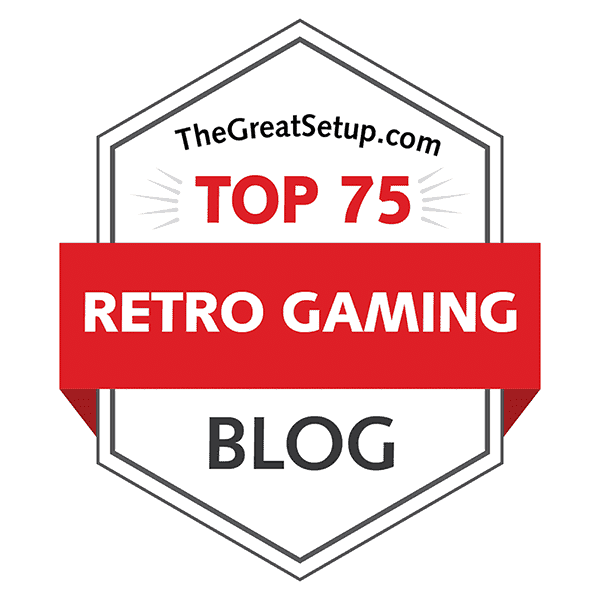 Some important information has to be given, if you are considering trying some of these out on your own, particularly if you're using an emulator, but these only concern the Amstrad and Atari ST versions. I only found one working Amstrad tape version (UK retail) from the internet, and it would only work on CPCE. The Atari ST version only loads up if you're using TOS 1.0. Conserning the loaders themselves: Amstrad and 128k Spectrum versions load up the full game in one load, and all the others will load up sequentially. Whether this given any indication towards the quality of the product on said machines will be revealed later on. DOS: no loading time, except booting up the PC. Disk, NTSC - wouldn't load up. Loading screens. Top row, left to right: Commodore 64, Apple ][, ZX Spectrum, Amstrad CPC. Bottom row, left to right: DOS CGA, DOS EGA/Tandy, Atari ST, Commodore Amiga. in different enough ways that I can't tell which ones are my favourites or even the least favourites. I guess the Amiga loading screen looks the closest to the box art, but it's still a bit bland. I'll be going in the order I try the versions out, naturally beginning with the C64 version because it's the original and I'm the most familiar with it. Section 1, the side-viewed jungle-maze plays something like a side-scrolling platformer with shoot'em-up and arcade-adventure elements in it. The important bits here are really the rate at which enemies keep coming at you, and the speed of bullets. While it definitely lacks in realism, the balance of these elements compared to your moving speed (and even the playing screen's scrolling speed) is what makes this section so playable. The only really unpleasant thing about this section is that it really is a maze that you either have to play using a map, or get the route completely in your head and play it by memory. Of course, some people are able to play games such as Sabre Wulf and The Great Escape from memory, so this should be a walk in the park, really. Section 2 is a first-person maze game, that plays much like any old 3D Pac-Man variant, but has the added feature of a shooting/searching crosshair to it. The whole movement protocol is made in a non-3D fashion, only moving your man one character block at a time on the map, and switching the action screen accordingly to the map. Whenever an enemy approaches, the movement stops and you switch to move the cross-hair and shoot the enemy. In the underground chambers, the cross-hair switches on again for you to search containers and shoot an enemy if necessary - and you can exit the chamber with the exit button. Once you get out of the tunnels, you are placed in a foxhole at night, shooting at the assaulting VC. This is an otherwise very basic shooting gallery variant, but the added feature of night-time and having to use flares to light the area is what makes this slightly more frantic than usual. I would say this should be the easiest section to reproduce on any system. Section 3 is the one that gets most of the harsh criticism, and not without a reason. Even on the C64, this 3rd person Contraesque maze level feels more like a modern Japanese bullet hell shooter than anything. The big difference to the similar bits in Contra is that you have to navigate through the mine-laden passageways by yourself - it's not just a thing of shooting enough enemies and some other main target on the screen, because there's an endless amount of VC around. You just have to get far enough in each screen to move to the next one. Finally, the crazy Sergeant Barnes must be defeated with 5 hand grenades, which can be picked up during the final battle. As if that were not enough, you have a time limit to do all this. As such, it's a really unpleasant and unrewarding finale, but who ever said war should be easy? Next up on the line, the APPLE ][ version. The first section has turned into a flick-screener, but it's not necessarily a bad thing in this case. It seems as though the Apple ][ has quite a lot of disadvantages in comparison to the other computers here, so it's nice to see the converters actually took a very different route here to make most of what they had. Either that, or they just had a very limited amount of time to put into the conversion, so it came out like this. Anyway, while being a flick-screener, there are some other rather significant differences. First, the map is slightly different, and is slightly more difficult to navigate, mostly because you get no landmarks anywhere - the graphics are very much simplified from the original. Second, you only get one other sprite at a time on screen at best, so there's no danger of accidentally shooting a villager while aiming at an enemy. Third, all the traps and aid parcels are placed at exactly the same spots every time you play - you will not find dead enemies dropping ammunition and health in this version. Fourth, you get 5 hit points per soldier instead of 4, but the exploding traps will still cost you a life. Now, I have no idea whether I have a problem with the emulator or the disk images, but once I had completed level 1, and had to switch to side B, the next level wouldn't load up. I tried another version, and it couldn't even finish loading the first part of the game. Too bad, because so far, it had looked quite interesting. YouTube didn't have any videos on the matter either, so this is where we end with the Apple version. Moving on to the NINTENDO version, then. Judging by the control system of the original, I could already tell that playing this game with the NES pad could be a very unpleasant experience. Which it really is. The D-pad of the NES controller wasn't exactly designed with precision in mind, so when playing this particular game, for instance, you would undoubtedly experience some "bad game design" as some people would complain. The thing is, you really need a joystick or a keyboard for this. Luckily, Nintendo also produced a proper joystick for the NES, so you can play some of your favourite C64 conversions on it. I, though, had to resort to an emulator and keyboard. So, in essentials, the game plays much as it should. The first section is a side-scroller, as it should be, but your character moves somewhat slower than in the original, and the rate of enemy attacks is kind of harsh in comparison. Also, the morale indicator has much less purpose here than in the other versions, for whatever reason. The second level plays very much like the original; there's only a couple of minor differences that will not affect your essential experience too much. Here, the morale indicator has been taken off completely, but considering the average NES gamer, it's probably all for the better. The foxhole bit is actually a bit easier than the original, since you don't really need to use the flares - even in the deepest darkness, the enemy soldiers are quite easy to spot. The final level is perhaps even more difficult than in the original, but essentially, it plays just like it should. So, with a joystick instead of a gamepad, the NES version gets surprisingly close to the original, but with a pad, it's mostly horrible. SPECTRUM has so far the worst playability. You are almost constantly bombarded with enemies from the trees and the ground level, either hiding on the ground and shooting at you when you least expect them, or just walking from the side of the screen. At least this power-assault is made slightly less strainful for you by not killing your men entirely from stepping on a tripwire - instead you are only taken one hitpoint off. This doesn't really help, because the graphics have a look that make the tripwires really difficult to see, contrary to the C64 version, so you're very likely to be taking a tumble at every turn. The Spectrum version also has some bugs that make bullets go sometimes through the normal enemies without harming them, and sometimes the enemies will just walk through the trees or disappear altogether. Sometimes, you can even clearly see the enemies trapped between the trees when you enter a new screen, so there's definitely some bad programming going on here. I tried the first level a few times, but it was just too hard for me in regular mode, so I had to resort to a slightly more bug-fixed version in order to get to the further levels. Still, I could only get as far as level 2, because the difficulty is still a bit too unfair (at least for me) and the graphics and the scrolling are sometimes so bad that you can't see the bullets coming at you or the hidden enemies getting up. In level 2, your turning handles way too sensitive, and when you have an enemy on screen, your cursor is in contrast way too slow for you to ever be able to make it through the level. And there are still two acts to go through. This is where I gave up and checked out the rest from YouTube. The foxhole bit has the area of action stretched out sideways a bit, and the cursor moves a bit slower than in the original - again, but it doesn't look to be too hard when you use the flares like they are meant to be used. You have no chance of seeing the enemies in the dark, though, unlike in the other versions so far. The final jungle bit seems to be surprisingly easy, the enemies shooting noticeably less and all. Still, it's too little too late. The AMSTRAD conversion isn't all that different from the Spectrum - only a bit more colourful, but uglier, and plays much slower. All the bugs and other problems are present here as they were in the Spectrum version, so it's a good step down again. Taking another direction in the ways of horridness, we come to the AMIGA version. Sure, it plays fast enough - in fact, it plays way TOO fast. Even the first section is nearly unplayable due to the higher speed. You run faster than in the original, which wouldn't be such a bad thing, but the enemies are faster as well, and it makes reacting to everything a huge problem, especially when you try to dodge bullets. Okay, there's a certain degree of realism now, that bullets actually fly closer to their real speed, but it makes the playability impossible. It's supposed to be a GAME, damn it. Well, I couldn't even beat the first level on Amiga, so I had to turn to the ATARI ST version to see if it's as horrible. Surprisingly, it's actually a lot more playable. The bullets are still a bit too fast, but it plays just that bit slower enough for you to be able to somehow get a grip of it. So, considering the Atari and Amiga conversions were made by the same team, I'm assuming the Amiga version is the same in essentials as the Atari version, only impossibly fast. The biggest problem with the 16-bit conversions is that you're hardly ever able to see if there's a bullet or a trap or a hidden enemy soldier coming out of the ground, so you will be experiencing a lot more frustation here than on any other version. The graphics are really just TOO good for their own good. I tried to play both versions three times, and wasn't able to beat even the first level. On the Amiga, though, I only got as far as the TNT pick-up point, so there's still hope for the Atari. If you have more perseverance than me, you might actually like the 16-bit versions, but for someone who has grown with the original, these two are just stupidly difficult, and not really worth the bother. from an enemy shooting just out enough of the screen that you can only see a fraction of his rifle when he's shooting you from a kneeling position - and they always seem to shoot from a kneeling position, so you have to kneel quite a lot as well in order to kill anything, which makes proceeding in the map really a chore. One wrong has been righted, though: you can now change direction while kneeling - this isn't possible in any other version. It doesn't really help much, but it's there. Also, there are health and ammo packs along the way, just as in the Apple ][ version, but this same feature has been included to work with the tripwires as well. So there are definitely features from both the Apple ][ version and the original - which just do not work well at all when put together. I would actually rather play the Apple ][ version, which is certainly in most ways inferior, but still manages to be quite playable. Pity that the speed adjustment in DOSbox doesn't affect the gameplay in any particular way, except loading up the game. All in all, this is just as bad as the Amiga version, and I cannot honestly recommend either of them to anyone. So, the scores for playability might surprise some, but I'm pretty sure most of you will agree with me, if you have bothered to try each one of these versions out by yourselves. As I was only able to play as far as the first two levels in most of these versions, some of these screenshots have been copied from other websites, and I apologize for that. Perhaps that makes me an unqualified gamer, but I'm hoping that it's just the games that are ridiculously difficult, and some other gamers are phenomenally good. Let's start with the title screens, as it is the first thing to come up when the game has loaded up. Title screens. Top row, left to right: Commodore 64, Nintendo, Apple ][. Bottom row - DOS modes, left to right: CGA, EGA, Tandy. 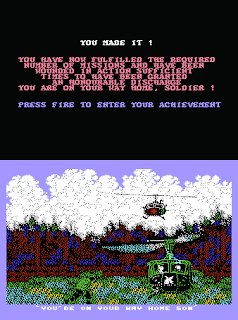 The original C64 title screen has a tasty credit screen that has the screen divided in two: the lower half with all the credits, taglines and high-scores, plus the bit above the logo with the very moody landscape-style portrait of ten soldiers' line as silhuettes against the white background. This picture used a method, pioneered by the demo scene and gradually used more and more in commercial products to great effect. NINTENDO's own 8-bit console had the advantage of using most of the screen by default, so there's no great sense of achievement in their version, but as if trying to mark their superiority, they added one more soldier to the line, and used the proper title logo in the start menu. The bottom row of the picture above are all from the DOS version, specifically from the CGA (left), EGA (middle) and Tandy (right) versions. For now, it looks like the Tandy version has no purpose, but wait until we get to the game itself. For some reason, I kind of like the CGA version best, because it has no unnecessary colouring on the logo, which is again in a different font than in the movie poster, but it's not quite as bad as on the Apple. Otherwise, they are all the same, and almost have seven soldiers' silhuettes fitted on the screen. More title screens. Top row: ZX Spectrum (left), Amstrad CPC (right). Bottom row: Commodore Amiga & Atari ST title sequence. In the two 8-bit versions left, we only get a simple text-based title sequence. The one on the SPECTRUM looks more stylized, but otherwise, is just as boring as the AMSTRAD version. I did not include the rest of the screens here, but it's really just the tagline and high scores list, so there really isn't much to see. The AMIGA and ATARI ST versions have the same title sequence - the three pictures you see in the lower half of the picture above, plus the high-score table. The top of the screen switches between PLATOON logo and the line of soldier silhuettes in their own pace, while the bottom of the screen changes in quicker intervals. It's very sophisticated, but kind of corny every time it gets to the "IS INNOCENCE" bit, although it has really a little bit more to do with the sound effect than the low quality digitized version of the falling soldier. Level 1, TNT pick-up spot. Top row: C64, NES, Spectrum, Amstrad. Bottom row: DOS (Tandy), Amiga/ST, Apple ][. Pictured above is an otherwise generic part of the jungle in the first section, but it's the one bit where you can find the explosives to destroy the bridge later on in the level. Apart from the Spectrum and Amstrad versions, they're all rather good and easy to look at. Sure, the Apple ][ version is clearly the most simplistic and lacking in detail, but precisely because of the lack of detail, it's easy on the eyes. Just imagine that graphical style with the amount of detail that it's supposed to have had... no thanks. Section 1, the bridge. Top row: C64, Amstrad, Apple ][, Amiga/ST. Bottom row: NES, Spectrum, DOS (EGA). Once you get to the bridge, you just leave the explosives in the middle of the first bridge (or the only bridge, in some cases), and your man starts running towards the village automatically. A few seconds later, you'll either stop and get a message that the bridge has blown up, or the screen even trembles along with the explosion and your man is thrown down to the ground. The screen above, however, is just the bridge where you will be leaving the explosives. The DOS version looks very good in its own way, but all the others are more constant with this section's overall style of depth. Clearly, the 16-bits have the best colouring and the clearest overall graphics, but from the others, I would say the C64, NES and Spectrum versions look the least messy. Section 1, the village. Top row: C64, Amstrad, Amiga/ST, Apple ][. Bottom row: NES, DOS (EGA), Spectrum. Across the bridge and first junction up, and you are in the village. Here, you will meet some innocent villagers in clearly - or supposedly - different colours, and some more randomly appearing enemies and tripwires. Naturally, the village has some huts, in which you will find some containers and furniture, in/on which you might find some important equipment to continue your journey down in the tunnels. The tunnel entrance is located inside the next-to-last hut, so you have some time still to screw things up by shooting innocent villagers. Now, this is where the graphics affect the playability the most in this game. You have to judge by a fraction of a second's look whether the wandering NPC is an enemy or a friend, and if he/she looks too much like every other NPC, you are very likely to shoot, just because you are so on the edge at this point that you really don't want to miss the chance to make it to the exit by not shooting and getting shot instead. One time I managed to get this far in the DOS version, but I shot a villager three times in a row by mistake, because they look too much like the enemy, and couldn't even get a screenshot of any village hut because of this. The Amiga screenshot is taken from LemonAmiga, hence no outer view of the hut. Also, when you look at the Spectrum version, the only way to tell the difference between a villager and an enemy is the hat, so the odds are you are going to shoot the poor innocent sod. The villager sprite from the Apple ][ version isn't in the picture there, but they have a decidedly yellow look, so it's very easy not to shoot. Anyway, the 16-bits unsurprisingly have the best overall look again, with C64, Amstrad and NES following closely behind. Choose your man. Top row: C64, Amiga/ST, DOS (Tandy). Bottom row: Apple ][, Spectrum, Amstrad. When you take damage or die, most versions of the game take you to a small screen, where you can select another man to continue the journey. This only happens in the first section of the game, so it's only logical to take a look at it now. The Nintendo version is the only one not to have a selection screen - instead it plays like any other Nintendo game: four hits and you lose a life, but at least you get to continue from the same spot you died at. The C64 and DOS look the best, and the Spectrum has the least colour, again. The Apple ][ version is the least informative, but you can clearly see that it's the only one that has 5 hitpoints per soldier. Section 2, confronting enemies in the tunnels. Top row: C64, Amstrad, NES. Bottom row: DOS (EGA), Spectrum, Amiga/ST. After what might seem like an enormously long time, you have managed to find your way down to the tunnels - or level 2, as the gamers might call it. The pictures above show a generic setting of you in some part of the tunnel, and an enemy of two variants attacking you at a random place. As I could not get the Apple ][ version to load up the second section, and the internet could offer no help either, the Apple ][ screenshots are dropped from this point on. The original C64 version has another nice special graphic thing going on with the special items shown in the low border. The NES version replaces the morale meter with the special items inventory, but instead of using icons, they are shown as letters, which is incredibly cheap. All the other versions have the special items shown between the map screen and the ammo and score indicators, which makes the bottom half of the screen look rather busy - especially in the two 16-bit versions, where you get the icons for music and SFX to go with the other three icons. The action screen is basically the same in every version, with obvious differences in palette and resolution. Clearly, the best graphics are in the 16-bits, followed by C64, NES and DOS. Section 2: random chambers. Top row: C64, Amiga/ST, Amstrad. Bottom row: DOS (EGA), NES, Spectrum. Above are a bunch of screenshots from random chambers in the tunnels. Obviously, the 16-bits look the best, followed by DOS and C64, with the rest following close by. The NES version looks strangely squeezed, though - even the EXIT button is in a different shape to suit the graphics better, so EX and IT are in two rows. Hilarious. Section 2: the foxhole ambush. Top row: C64, Amiga/ST, Amstrad. You get to the foxhole after clearing the tunnels and climbing the correct ladder. Whether you call this level 3 or the level 2 boss fight is your own choice - the game doesn't seem to think it has any levels anyway, they're just unnumbered sections. Now, you might have noticed there's another conversion dropped from the picture above - that's the DOS version missing, because I couldn't find any screenshots from the foxhole bit, and I couldn't get that far myself. Of these five, the 16-bits take the cake again, but I have to say the Amstrad version looks surprisingly good. The C64 and NES versions are the most playable due to a rather good visibility in the dark, although I really cannot tell whether this is the case in any of the other versions. Based on the YouTube video of the Spectrum version, it didn't look as though you could see anything in the dark, but then again, it's YouTube. Section 3: the Contra-like jungle confrontation. Left to right: C64, Amstrad, NES, Spectrum. Level 3, better known as The Jungle Confrontation, again drops one of the screenshots due to unavailability and impossibility. On the C64 and NES, I could even get that far by myself, but the other two screenshots are from the amazing world of internet. You can clearly see the C64 and NES have a similar thing going on for them, and the Spectrum and Amstrad versions have their own style. There's certainly less field of movement in the latter two, which makes for a slightly quicker game. Whether this gives more playability or takes it away, is probably more up to the gamer than the game, I couldn't really tell. DOS graphics modes comparison, left to right: CGA, EGA, Tandy. Before the inevitable wrap-up, let's take a quick look at the three DOS modes. 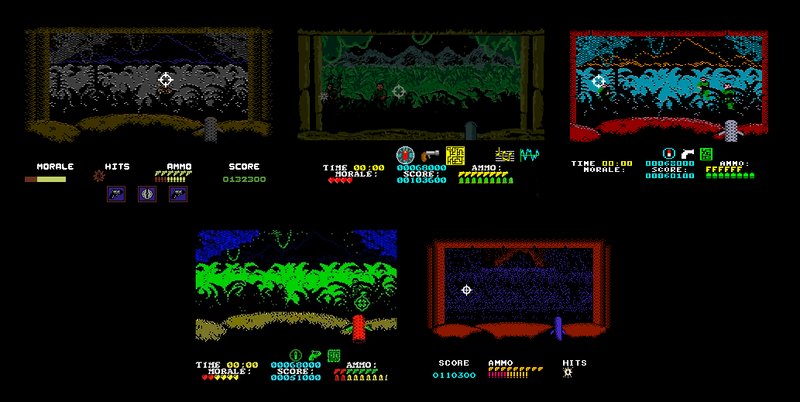 The CGA mode shown at the left is clearly the least colourful, but essentially, it's still the same. Strangely, the bullets are more obvious in CGA than in the better two modes, so I almost prefer this. However, the EGA and the slightly more detailed Tandy mode look so much more natural in colours that preferring the CGA mode would make you look weird. There isn't much to say about the ending - it's either poor or very poor indeed. Even the 16-bits haven't got more than a congratulations message, so I suppose the C64 ending is the most you are ever likely to see as an ending for this game. Still, if you have managed to complete the game, it's nice to have at least some sort of recognition for the heroic deed. 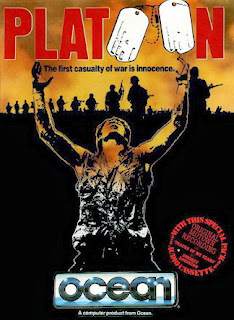 Jonathan Dunn's original soundtrack for Platoon is another iconic set on the COMMODORE 64, featuring 9 lengthy tunes and a couple of effective sound effects, one of which was a scream by none other than Zach Townsend himself - the programmer of the game. Dunn's signature style to use the SID chip to take as much out of it as possible in ways of instrumentation comes really forth here - you get drums, distinctive bass lines, really sparse chord arrangements in order to make more room for the main melodies and some really interesting tricks to even bring out the few sound effects simultaneously with the music. There are no gunfire effects, but you don't really miss them, when the music is so good, and you can see the bullets flying well enough anyway. The only thing I can think of that is missing is a rendition of the hauntingly beautiful Adagio tune from the movie itself by Samuel Barber, which would have fitted very nicely in the ending picture, or even the main loader. If you wish to, you can turn off the music from O and turn it back on from M.
David Whittaker did most of the converted soundtracks, with varying results, but he mostly did a fine job. Starting with the SPECTRUM sounds, the 48k has understandably very little in terms of sounds - only indistinguishable pops of varying pitch and an explosion sound, although it does have the theme tune that is actually a remarkably well made conversion for the beeper. The 128k Spectrum uses the AY-chip, so it has all the tunes sort of intact, and they sound much closer to the original, although the first level tune is cut shorter and it modulates and loops only half of the song. But it's a big step forwards. Next up from David's conversions comes the AMSTRAD soundtrack, which takes another step forwards from the 128k Spectrum soundtrack. This one manages to be even more percussive and the use of instruments is a bit more expressive than on the Spectrum. The first level tune still has the latter half missing, and it loops from the middle with modulations, but it's still better. There are also some more pronounced sound effects included in the mix, so it's definitely a big plus. ATARI ST's version, also made by mr. Whittaker, sounds surprisingly like the Amstrad version, when using the Atari's native sound chip. The only things I found that are completely new are the VERY strong gunfire, explosion and death yell sound effects, which are rather effective, but somehow can become tiresome. Whittaker's AMIGA version has all the same effects, but the music is beefed up quite a bit - feels more like a remix of the soundtrack, actually. The biggest difference between these two versions is actually not the way the effects and tunes sound, but the way they affect the gameplay. In the Amiga version, every sound comes out naturally and do not affect the gameplay in any way, while in the Atari version, the big sound effects pause the game for the duration of the sound. I can't really tell whether either of these is a good or a bad thing, because the Amiga's frantic pace misses the opportunity give a small chance to breathe here, and with the Atari's slightly less frantic pace, the pausing sound effects just slows it down even more, and don't necessarily add anything to the full experience. It's another matter of opinion, but this would be a much clearer issue, if the Amiga version played less hurryingly. However, these two have a unique feature where you can toggle sound effects and music, so there is at least a nice way to choose your sonic environment. Whoever made the sounds for the NINTENDO version, didn't really take all the advantage of the capabilities of the NES soundchip, but all the tunes from the original have been converted more or less successfully. Some of the instruments sound a bit out of tune with the others, and the drum section severely lacks the oomph and attack that are so clear in the original. Then again, this leaves some room for the sound effects, which are more percussive than usual, but still manage to be less impressive. From the two conversions by Quicksilver Software, the DOS version has the bigger variety of sounds, and even the theme tune is included, although it sounds just like an old DOS game most likely would - horrible and bleepy. Interestingly, this conversion seems to have the most different sound effects, and while they sound like an old DOS game, it still brings enough sounds into the game to become almost even enjoyable. Better to have a good amount of colourful sound effects than no music and very little effects, so while the 48k Spectrum version has the better theme tune, I have to place this one a bit higher exactly because of the effects. I mean, you don't load up the game just to hear the tunes, right? Finally, we get to the APPLE ][ version, also by Quicksilver. This is just... for a lack of a better word, pathetic. No music, and only a bit more effects than what the 48k Spectrum has. I really can't place this one anywhere but at the bottom. This is another one of those "what to do" situations, where the importance of sound effects and each machine's native sounds comes in conflict with the musical aspects and even playability. So, this time, I will let my preferences give some more voice than I probably should. Platoon is not perhaps one of the most comfortable or playable games of the classic era, but it certainly made an impact on us when we were young. Perhaps it's one of these sorts of things that keeps us young even now that we're undeniably older - reminiscing and replaying games that we used to be in awe of, and thinking all the modern games are crap. Of course they are, but that's beside the point. Back in 1987, most of the graphics and sounds that were present in big budget games were of this calibre, and if you got a really good coder like Zach Townsend on board, the game was almost certainly a hit, because you knew them to be top-notch at the time. But - as pointed out earlier, Platoon as a game had not much new to offer in terms of gameplay - the only relatively innovative things were graphical, mainly in level 2 with the first-person mode. So anyway, when the game originally gets tailormade for a certain platform, it will always suffer in one way or another when converting it. This is why it is such a pity that people who only have contact with the version they were only able to play when they were younger, only have seen that particular side of the coin, regardless of whether it is the better or the worse side. Most of all, it seems the Nintendo gamers have a deeper hatred towards this game, and all because they have the wrong controller. There are good and bad points in every version available, but this is really one game that should only be rated by its playability. Unfortunately, the mathematical overall results list seems to think otherwise. I only agree to this list as far as #1 goes. Working on this comparison was a really interesting journey for me, and I was positively surprised by a few unexpected conversions - namely the ones on Apple ][, DOS, Nintendo and Atari ST. Of course, if you have enough patience to hone your skills, you might even beat the Amiga version, but I'm trying to limit my working schedule for each blog entry at two weeks maximum, with some exceptions. The order of my favourites would be: C64, NES, SPE, CPC, DOS, APPLE ][, ST, AMIGA; so the graphics and sounds have very little to do with how good I think the game is. As a final note, I would like for you to try them all out by yourselves, preferably with a map, and see how many versions you can beat - or even get past the first two sections. For a map for the C64 version, check out C64-Wiki's page for Platoon - it should be relatively close to the other versions as well. Good luck, and happy hunting! Comments, suggestions and corrections are welcome as always. Thanks for reading again, see you some time next month! This is excellent stuff. Waiting eagerly for some comparison tests on games I remember. Loved Platoon and recently went through it myself on the 64. I totally agree with the outcome of the comparisons. C64 version was very atmospheric which all other versions failed to capture. Spectrum version was a great conversion in my opinion, just lacked the atmosphere of the original which was only down to the colours used and the soundtrack.